White sapphire silver wedding set inlaid with Australian opal. 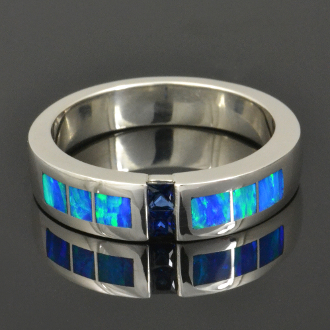 Man's sterling silver wedding band featuring 2 channel set blue sapphires accented by inlaid lab created opal. The two princess cut blue sapphires have a total weight of .30 carats and are high quality. The inlaid blue-green laboratory grown opal harmonizes nicely with the dark blue sapphires. This man's wedding ring measures about 6mm wide and is shown in a size 10 for scale. The ring is available in other sizes and color combinations by special order in 3 to 6 weeks. It is hand signed "MMH" by Mark McBride Hileman on the inside of the ring. A matching woman's band is available if you would like to wear this ring as part of a wedding set. Check the "Matching Woman's Band" option and select a woman's ring size from the size options. The lab created opal in this man's ring is a top quality synthetic opal grown under laboratory conditions. The manmade opal's chemical composition is the same as natural opal with the exception of water content. Australian opal contains about 4% water and lab created opal contains no water. Instead the water is replaced with resin. The resin gives the synthetic opal more durability and helps to resist cracking. Laboratory grown opal gives you all the fire and colors of top grade natural opal at a much more affordable price with increased durability.